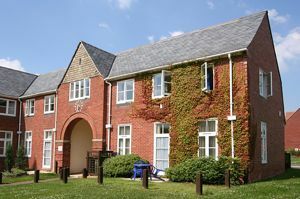 The surgeon, Gaythorne Girdlestone established the Wingfield Convalescent Home, at Headington, Oxford as an orthopaedic hospital. It was offered, during the First War, to the War Office as an auxiliary hospital. In 1919 the hospital admitted its first crippled children. With Sir Robert Jones, a Liverpool orthopaedic surgeon, the pair pioneered the care of crippled children in this country, and encouraged the establishment of similar hospitals. Devon Education Committee, responded to a request from the Board of Education, in November 1925, to make provision for treating children in the county, suffering from the many common crippling childhood diseases that often led to paralysis and even death. It was estimated there were about 400 children of school age, and 200 below school age, who suffered from these diseases, in the county. It was also estimated that about 80% could be cured, with appropriate care. Although rickets was not endemic in Devon, other crippling diseases existed—TB of the joints and bones, polio and congenital deformities of the hip were not uncommon. A stay in hospital could stretch into months or even years. The question of payment for the treatment was raised, and it was estimated that the County Council would have to expend about £3,680 per annum—hospital stay was estimated at 2½ guineas per week per child—to meet the cost. In addition, a suitable hospital would have to be provided. Hence, the idea for what would become the Princess Elizabeth Orthopaedic Hospital was born. "I hope that the county will support Dame Georgiana Buller in her great work. Devon, I have always maintained, should lead the way. It is a wrong notion that Devon is a sleepy place. Her sons founded the United States, her sons built up the great mercantile supremacy of England, and she should still lead England forward." Citizens of the county had been raising funds since 1925, and by October 1927, £2046 19s 3d, along with additional donations from the Rotary Club, and some large, anonymous sums, amounting to £21,000, had been raised towards the new hospital. Housed in the grounds of Gras Lawn, the former house of James Veitch, on the site of Buckerell Bore, a natural spring, the Princess Elizabeth Orthopaedic Hospital was opened on the 16th November 1927 by the Duchess of York, using a 'golden key' for the occasion. It was named, at her request, after her infant daughter, Princess Elizabeth, the present Queen. The area served included Devon, North Cornwall and Lyme Regis, with nearly seven hundred certified case, waiting for specialist treatment. The new hospital was to open practically debt free, which is more than can be said of some modern hospitals built under Private Finance Initiative. 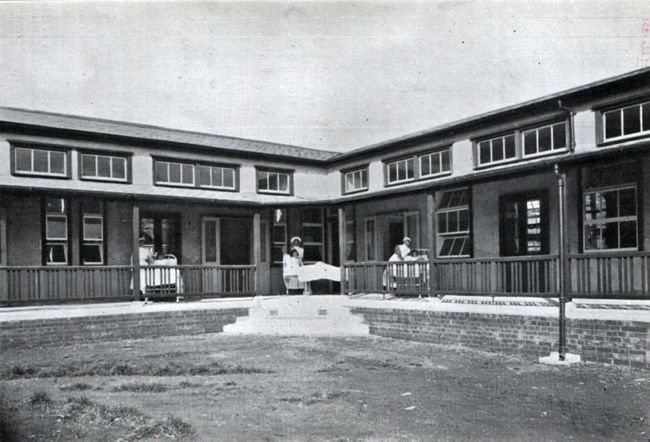 Alongside the main building, there were constructed two ward blocks, built with one side open, for fresh air. Soon, clinics at Barnstaple, Honiton, Okehampton, Torquay and Tiverton were feeding patients to the Exeter facility. By the end of 1928, the hospital had admitted 74 boys and 51 girls. 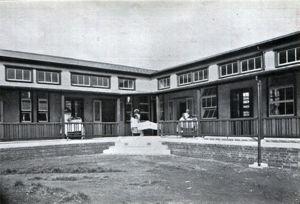 In 1932, the hospital was enlarged and a Convalescent Annexe added. The first 'chief surgeon' was Brennan Dyball, who was by 1927, an established surgeon at the Royal Devon and Exeter Hospital. In 1931, Norman Capener, a St Bartholomew's trained orthopaedic surgeon, returned from working in America to become the hospital's first consultant orthopaedic surgeon, a post in which he remained until 1963. Frederick Durbin, who worked under Capener, became the senior surgeon on Capener's retirement. Wards in the modern Princess Elizabeth Orthopaedic Hospital are named after these three pioneers. The surgeon, Norman Capener was a talented artist, singer, archivist and Exeter Cathedral steward. Barbara Hepworth met Capener in the 1940s, when he treated her daughter Sarah in 1944 , for osteomylitis of the thigh. She encouraged him to take up stone carving as therapy, following an illness. 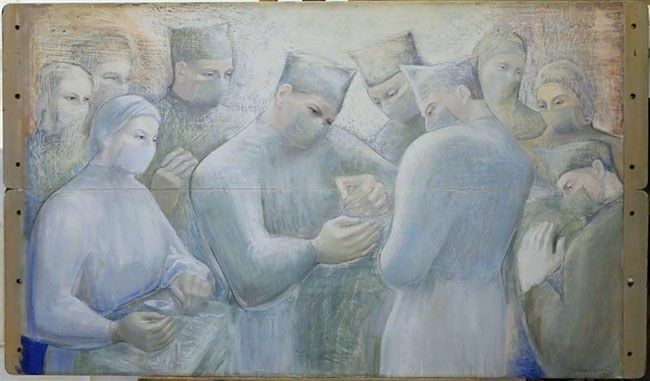 Hepworth was subsequently invited to observe, and draw, surgical procedures, in the operating theatre by Capener. Hepworth made a series of drawings on coloured boards, of the team performing operations, and the example, right of her work, is the only to have been painted in oils. She drew seventy drawings, many of which, are now in private collections. The Hepworth Gallery in Wakefield had an exhibition of the drawings, along with other material, including extracts from her sketchbooks. The hospital is responsible for the pioneering Exeter hip which was developed in 1969, and which was first inserted into a patient in 1970. It was developed by the hospital's Professor Robin Ling and the engineer Clive Lee of Exeter University. It is manufactured by Stryker, from stainless steel. One patient has had a hip for 33 years (at the time of writing) without a problem. In the seventh UK National Joint registry report of 2010, the Exeter hip had 60% of the market. The 5 year failure rate of the hip was 1.9%. In 2010, the device had its millionth implantation, with 40 years of clinical use and was nominated the Which Medical Device, Device of the Year! When the new Royal Devon and Exeter Hospital was built in the 1990's, the Princess Elizabeth Orthopaedic Hospital moved into new facilities, as part of the main complex. Much of the old site is now housing, with the office facilities, the living rooms of houses. Sources: Western Times, Exeter and Plymouth Gazette, various websites about the Exeter hip and Richard Newell.